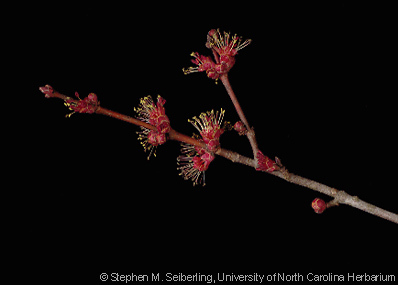 Acer rubrum L. Red maple, carolina maple, eastern red maple, scarlet maple. 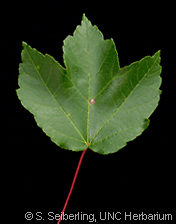 Synonyms Acer rubrum var. trilobum Torr. & Gray ex K. Koch, Rufacer rubrum (L.) Small. Family Sapindaceae. ITIS Taxonomic Serial Number 28728. 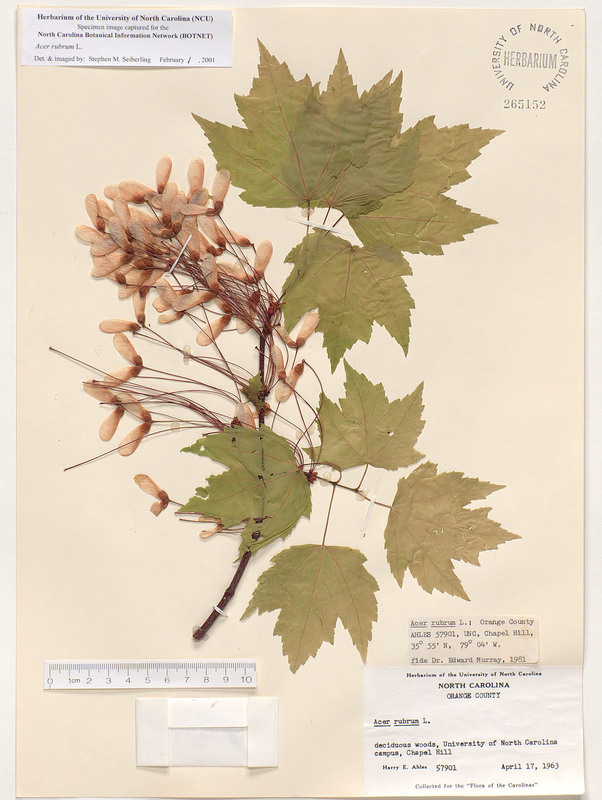 USDA PLANTS Symbol ACRU. TROPICOS # 00200014. Images  Branchlet with leaves.  Individual leaf 1.  Individual leaf 2.  Branchlet with buds.  Close-up of buds.  Branchlet with flowers.  Close-up of flowers.  Close-up of fruits.  Herbarium sheet 1.  Herbarium sheet 2. 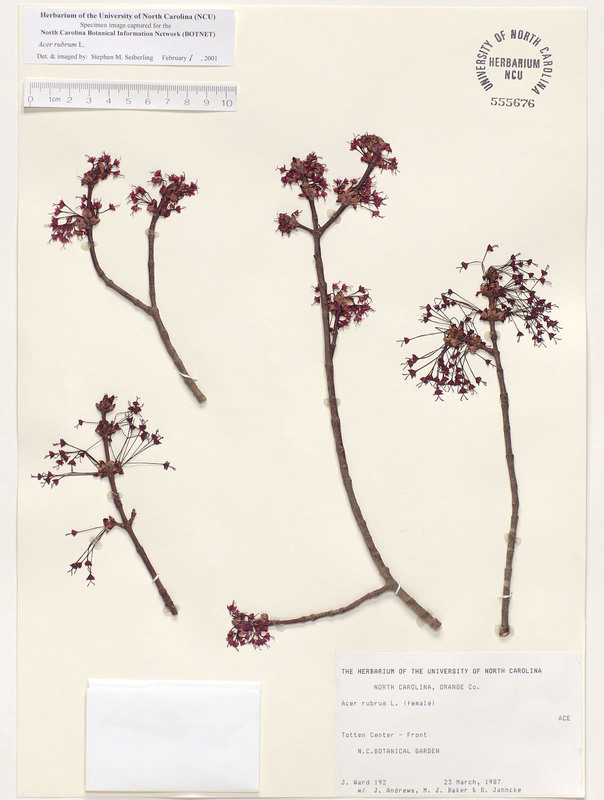  Herbarium sheet 3. 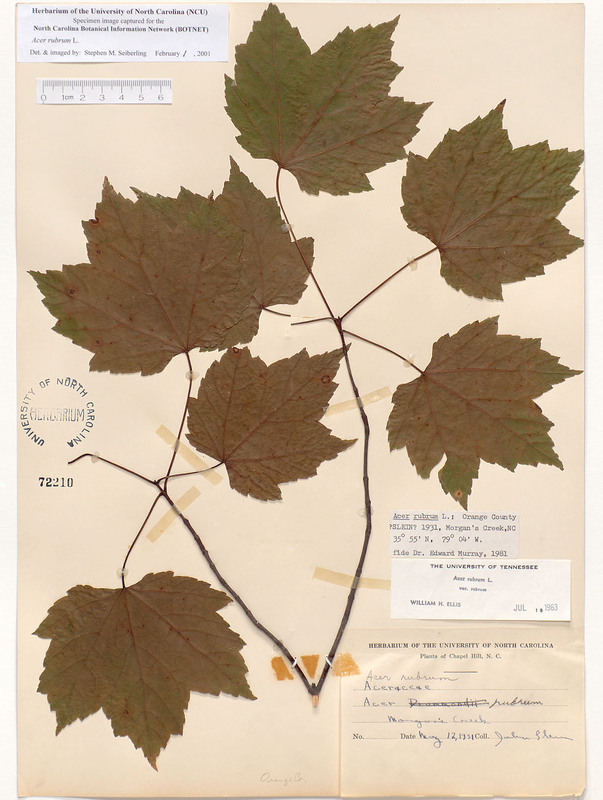  Herbarium sheet 4. Brief Description: A small to large-sized, deciduous tree, typically 1535 m (50115 ft.) tall when mature. Bark is gray and smooth, becoming furrowed and ridged with age, sometimes with plates. 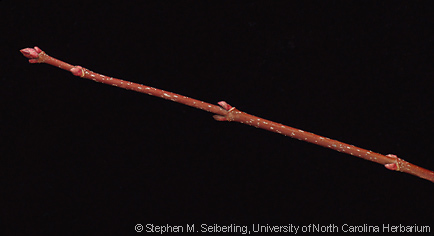 Young twigs are often red. Leaves are opposite, and shallowly to deeply palmately lobed (rarely unlobed). 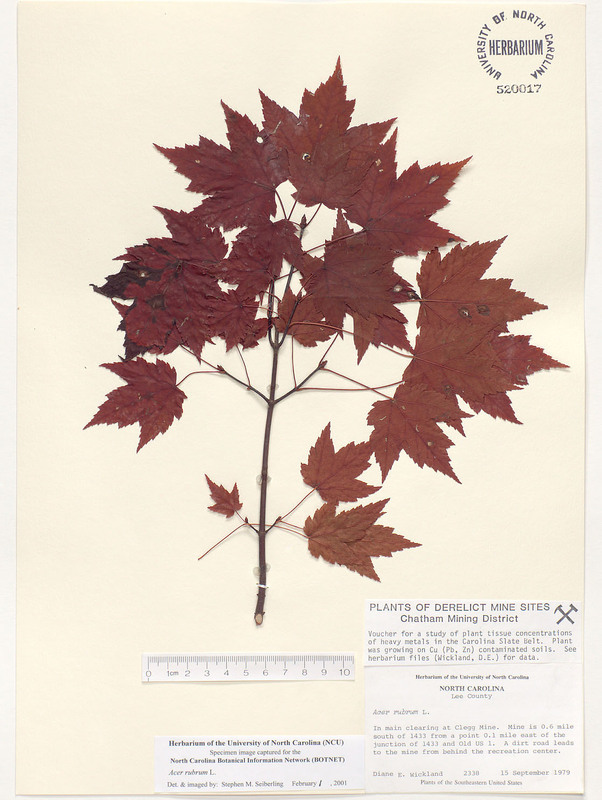 The leaf margins are irregularly serrate, with sinuses that are sharply V-shaped, unlike those of southern sugar maple (Acer barbatum) which are rounded. 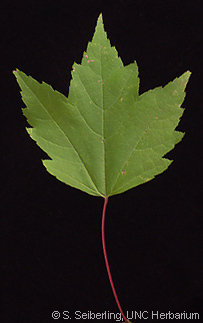 Also, the sides of terminal leaf lobes are widest at the base, tapering to the tip, while those of southern sugar maple are more or less parallel. 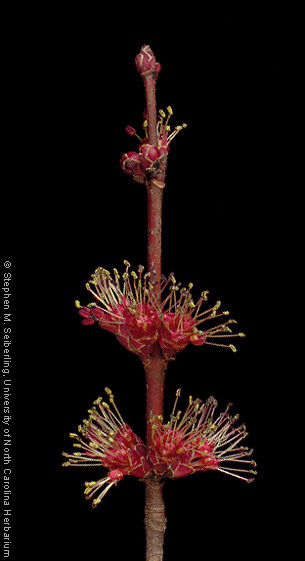 Separate male and female flowers may occur on the same or on different trees, or they may be combined in bisexual flowers. 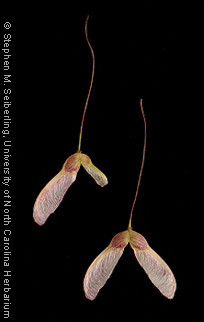 Fruits consist of two, winged samaras that split apart when mature, sometimes traveling long distances on the breeze as they spin to the ground. One of the most widely distributed native trees in eastern North America. Plant habit and life style. Plants Angiosperms, monoecious or dioecious or polygamous, (5)1535(40) m tall. Stems. Pith continuous. Young twigs (1-year-old or less) green or red, glabrous or glabrate. Twigs (24 years old) glabrous. Leaf scars U-shaped or V-shaped, bundle scars 3 per leaf scar, stipule scars absent. Bark of mature trunks furrowed or plated or ridged or smooth. Buds. Buds axillary or collateral or terminal, red, (2)3(4) mm long, globose or ovoid, blunt, glabrous or pubescent, ciliate, bud scales imbricate. Leaves. Leaves deciduous, simple, petiolate, opposite or decussate, (3)515 cm long, (3)615(18) cm wide, obovate or orbiculate or ovate, leaf margins serrate or doubly serrate, unlobed or shallowly lobed or moderately lobed or deeply lobed, palmately lobed, leaf lobes (1)35(9) per leaf, leaf apices acuminate or acute, leaf bases cordate or cuneate or obtuse or rounded or truncate. Leaf upper surface green, glabrous or glabrate. Leaf lower surface green or silver or white, glabrate or pubescent, pilose or tomentose. Leaf venation palmate. Petioles (3)510 cm long, glabrous or glabrate or pubescent, puberulent. Stipules present or absent, caducous. Flowers. Flowering January or February or March or April. Inflorescences axillary, simple umbels, flowers stalked. Flowers bisexual or unisexual or pistillate or staminate. Perianth. Calyx radially symmetric, aposepalous. Sepals (4)5(12) per flower, 13 mm long, ascending, red or yellow, oblong, sepal apices obtuse, caducous. Corolla radially symmetric, apopetalous. Petals 5 per flower, (0.5)13 mm long, ascending, red or yellow, linear or oblong, caducous. Androecium. Stamens 58 per flower, separate, anthers 1.52 mm long. Gynoecium. Ovaries superior, pistils 1 per flower. Gynoecium syncarpous, 2 carpels per flower, styles 2 per pistil, stigmas 24 mm long, placentation axile. Fruits. Fruits mericarps or samaras or schizocarps, (1)1.54(5) cm long, brown or green or red or reddish-brown or yellow or yellow-green, fruit maturation 1 years. Habitat. Habitat bogs and seepages or bottomland forests or disturbed and weedy areas or dry-mesic upland forests or mesic upland forests or mixed forest edges or rock outcrops or suburban plantings. Special Diagnostic Characters. Terminal leaf lobe is widest at the base, tapering to the tip; leaf sinuses are sharply V-shaped. Cite this publication as: ‘Stephen M. Seiberling, Alan S. Weakley, and Peter S. White (2005 onwards). 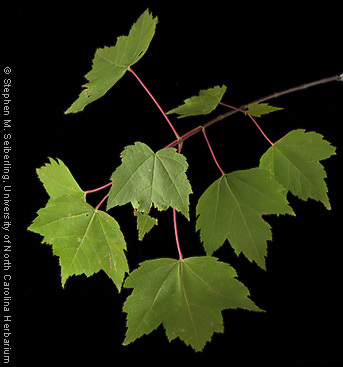 Common Trees of the North Carolina Piedmont: Identification, Descriptions, Illustrations, and Glossary. Version: March 7, 2006. <http://www.ibiblio.org/openkey/intkey/>’.